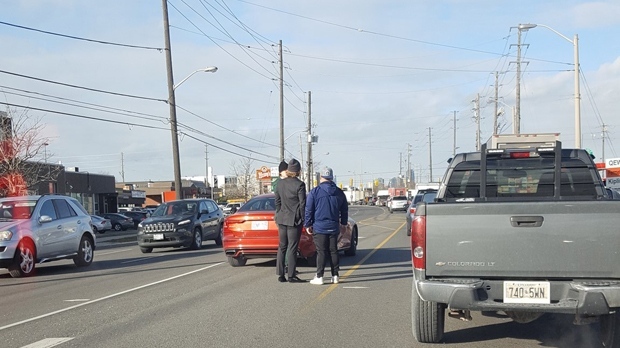 Toronto Maple Leafs William Nylander and Kasperi Kapanen were involved in a minor collision outside the team’s practice facility in Etobicoke on Friday, a spokesperson for the Maple Leafs has confirmed. The incident occurred around 2:20 p.m. on Kipling Avenue near the Mastercard Centre for Hockey Excellence. There were no injuries, the Maple Leafs said. Images from the scene show a burnt orange Volvo sedan with damage to its passenger side. Nylander played his first game with the Maple Leafs on Thursday evening after signing a new contract with the team last week. Nylander’s contract expired in July and negotiations stretched throughout the summer, forcing him to miss 26 games of the season. The deadline to resign from the team was 5 p.m. on Dec. 1. The Maple Leafs lost to the Red Wings 5-4 during his debut.